By Lyns on May 11th, 2009 . Filed under: Announcements, Baby, Birthday Ideas, Contests, Crafts, Cupcake Ideas, Decorating, Kids, Party Items . With May in full swing and Mother’s day behind us Summer is coming and with that is a bounty of fun! So here at Sweet Cuppin Cakes we wanted in on all that fun. Starting we have hooked up with another clever crafting cupcakkie for Our Talented Cupcakkie Crafters end of our store, where we feature several cupcakkies you already know like Cakespy, Bake and Destroy, The Glass Chef, Gigi Minor, Chic Baby Rose and Sugar & Meringue. We will continue to feature these special artists in our shoppe so you can easily access special treats. Emily at Sugar & Meringue is one special lass to get to know through her blog and awesome creations. 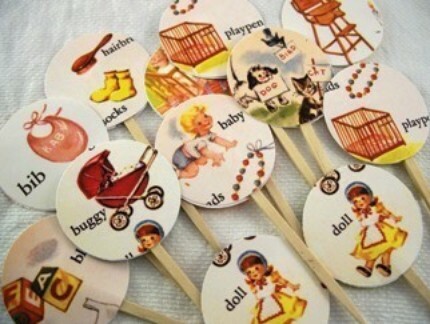 How fun are these for a baby shower or a baby party or just to be real retro and cute in a scrapbook project. Emily takes great care handcrafting these and the finished project is awesome! We will give you a package of 50 liners with your purchase from Sweet Cuppin Cakes. Now for some more fun, if you have a design that you would like to see as a topper, send it on to me at acupcakery@yahoo.com Subject ATC SCC Summer Contest #1 We will send out a notice when we have enough designs that will be enough to choose from. I look forward to hearing from you. The winner will receive a bounty of cupcake toppers and liners.